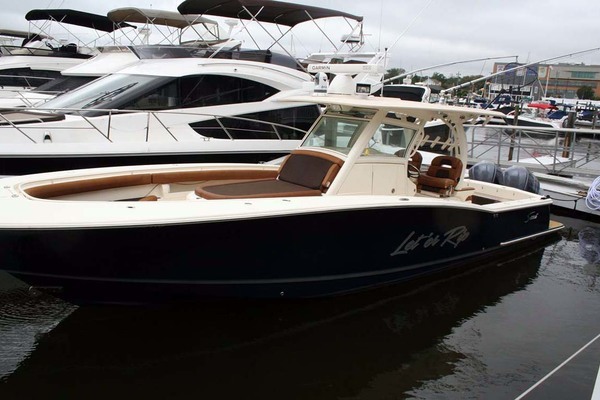 This 2008 Scout 295 Abaco is a one owner boat first derived in 2009, it has had a pampered life always being stored indoors, powered by twin Yamaha 250 4-strokes (268 hours). Sitting on a custom built 2009 Float On all aluminum triple torsion axle with disc brake trailer. This boat is a rare find. United Yacht Sales New Jersey would love to guide you through a personal showing of this 30' Scout 295 Abaco 2008. This yacht for sale is located in Sebastian, Florida and priced at $112,000. For a showing please contact us by filling out the form on this page and we will get back to you shortly! Garmin 4717 chartplotter - fishfinder - sonar - Raymarine VHF radio, stereo system, Yamaha digital gauges, removable transom bench seat, transom live well, (2) fish boxes, tackle storage, cockpit fresh water sink, fillet table, ice box, port side mid-ship bench seat, large windshield with removable eisenglass, taco grandslam telescoping outriggers, sea star hydraulic steering, rod holders, gunnel rod storage, large entrance to cabin, microwave, stove-top, refrigerator, fresh water sink, water heater, V-berth with removable table and fill pads, enclosed marine head with fresh water sink and shower head, aft berth, electric windlass with stainless steel Delta anchor, navigation lights and courtesy lights.